It is indeed true that money cannot class—even in the world of the Knowles. 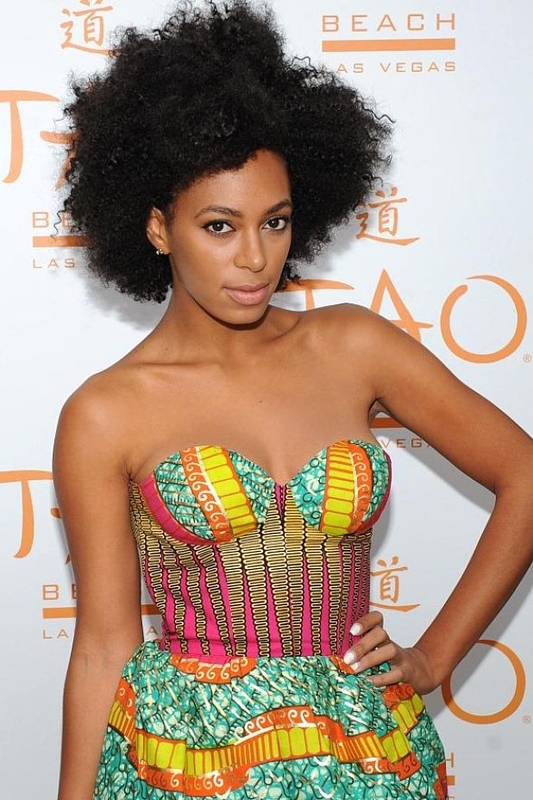 In fact, Solange is known for her foul mouth, with many having branded her the ghetto chick of the Knowles family. Whatever it is, Jay-Z must be applauded for being a real man—restraining himself when Solange was all over attacking him with kicks. And she even went further to spit on him. Before the 3 celebrities attended last week’s Met Gala, there was this mess up incidence that took place at the Standard Hotel in NYC. In surveillance video obtained my celebrity blog-TMZ, Jay Z, Beyonce and Solange are seen stepping into an elevator … and then Solange goes crazy, screaming at Jay before unleashing a violent attack. She did it all, kicking, screaming and spitting on him but Jay did not throw a punch. At one point, Solange thew her leg and Jay caught it in the air. What did you want Beyoncé to do?My hats goes off to Jay he conducted himself like a gentlemen, in a awkward unfortunate situation. A lot of guys aren’t mature enough,to deal with an emotional person like he did. No matter what the situation was Solange shouldn’t have carried herself like that. there’s a time and place to address issues and that was not one of them. she needs to learn how to control her emotions. if Jay attacked her, he would have been the most hated person in the world right now. But because she’s a woman doing the attacking, everyone finds it funny. When in fact it’s wrong. Real talk!! He ignored her to protect his career, real men don’t fight back. Solange her self will feel bad after a while. Jay Z is a true gentleman, i can imaging what would have happened if Kenya west was in his place lol. One lesson i picked from the whole thing is that third parties should not be allowed too much room in our relationship. Couples should protect their marriage (relationship) from third parties including family members and accord each other the needed respect. Third parties (including family members) will then have no option than to respect your partner. Jay Z and wife should take a second look at the way they relate with family members and restrict them a bit if they want to save their marriage. I learnt that Solange wrote on her twitter account that Jay-z hit Beyonce.well she deleted it later.She was standing up for her sister.Thats why Beyonce stod there doing nothing and even left with her sister after that.According to sources,all is not well with the couple behind closed doors.This is some new news you guys can all check out yourself.If its true,i don’t condone violence but would be more disappointed in jay-z. That tweet was fake. We still don’t know what happened.